Gully Boy’s musical notes carefully w’rap’ a nuanced yet entertaining narrative. Ranveer Singh’s Murad silently looks at his reflection on the glass door of a five star hotel in a scene from Gullyboy. Bright shining Mumbai lights look down upon him as a claustrophobic Murad sits on the driver’s seat in a posh car in another scene. Writers Zoya Akhtar and Reema Kagti give us innumerable such nuanced moments amidst the chaos in their latest collaboration. Their musical notes w’rap’ a narrative reflecting issues both socio-cultural and deeply personal. Gully Boy is a sensory experience and unlike what the title suggests, it’s not just the story of a rapper who discovers his worth and finds his place in the society. It is many things at once. It’s an account of social division (there are instances that ‘look you in the eye’ addressing social class & race or others that subtly attack casteism & sexism) while never making a hullaballoo about it. There is camaraderie and maturity alike in a comfortable love story that never seeks your attention (though you’ll still find yourself drawn to it). There is compassion in a mentor-mentee relationship (read Murad and MC Sher). There is passion and ambition in altering one’s reality through talent and hard-work (a slum boy is aware of his talent needing just a nudge that comes from his strong partner who is equally confident that she’s a brilliant student and will be able to sustain a livelihood for both of them, lest he fails). There is defiance to being victims of circumstance (The obvious example is GullyBoy himself who wouldn’t accept being a meagre driver or service personnel that he is ‘destined’ to be. There is also a middle-aged woman who challenges orthodox social norms whilst refusing to accept her husband’s second marriage on one hand and a young woman who confronts her parents as she is forced to find a suitor amidst crucial years of her career). There is mockery of the economic and social divide (an underprivileged man counts his steps to measure an affluent artist’s bathroom size for the SKY is out of his reach). Strong sub-plots like these add to the texture of GullyBoy as the writers treat each character and theme with equal respect. The film taps into a strikingly different note for both the music and its protagonist and this change is more than welcome. The music is fresh and the rhythm often compels you to swing up and down with its metre. This is asli Hindustani hip hop – peppy, upbeat yet rustic and deep (add to that verses from Javed Akhtar’s poetry and voila!) So is the case with Ranveer Singh. He isn’t that exaggerated figure you’ve seen at events or interviews recently. He’s the silent powerful performer (the one you might have last noticed in Vikramaditya Motwane’s Lootera or partly in Zoya’s Dil Dhadakne Do). Jay Oza’s camera focuses on his pale face or sometimes his feeble eyes that carry his Murad(wishes) and he draws you into his world effortlessly! Safeena(played by Alia Bhatt) is Murad’s childhood sweetheart and their romance is a treat to watch for it thrives in their comfort instead of the usual mawkish mush. She is strong. In fact, she’s a terror for most of the men and a bomb that’ll explode when you least expect it to. So is the explosive Amruta Subhash who makes one of the boldest statements of the film amidst an orthodox family setting. Not to miss is Vijay Raaz (from Dhamaal & Welcome), the rigid & brutal father as opposed to the funny man you must’ve recalled from his previous films. Siddharth Chaturvedi as MC Sher is the man of the hour- a seasoned rapper and a befitting example of the quintessential mentor for aspiring artist Murad. With GullyBoy, Zoya Akhtar goes back to her Luck By Chance zone (remember her first film tracing the journey of a struggling actor amidst the glamour in the world of Hindi Cinema) this time presenting the journey of a struggling artist in a bustling city that seldom acknowledges ‘the bhookhe fakkad’. The best part- not once do the writers glorify unfortunate situations. The Gullies are the heart and soul of our gully boy (come on, he raps about and within his gullies)! There is enough to like about GullyBoy’s silence and sound. If you don’t like the silence, you’ll definitely take back the sound and shout ‘Apna Time Ayega’ in events and situations hereafter. © 2019 reachyashika. All rights reserved. You’re bound to expect matured storytelling and nuanced characters from a director whose creative lineage is exemplary. Having woven stories around surrogacy in 2002 with Filhaal and the intricacies of the Indian judiciary with Talvar, Meghna Gulzar subtly etches the futility of war in Raazi. “Aap log na rishtey samajhte hai, na jasbaat, “recounts a heartbroken Sehmat(Alia Bhatt) in one of the soul-stirring scenes of the film. While this is just an underlying theme of the otherwise patriotic spy thriller, the director-actor duo often leaves you with moments that shake you from within! Sehmat is a simple young girl who is pulled into a confidential alliance with Pakistani soldier Iqbal(Vicky Kaushal) owing to familial duty. Sehmat must fulfil her father’s (Rajit Kapur) wish of living for the nation and thus begins her journey as a spy with a focussed and rather ruthless trainer, Jaideep Ahlavat. While tensions begin to build up between India and Pakistan just before the war of 1971, Sehmat is compelled to provide undercover information about Pakistan’s secret plans that eventually led to the Ghazi Attack. Camouflaging under the garb of a newly-wed, and risking her life every minute, Alia Bhatt’s Sehmat draws you in to her world so much so that your heart thereafter beats along with hers. You sense her vulnerability, embrace her courage, pulsate in her fear and eventually drench in her tears! She almost paints an emotional graph of the transformation of simplistic humans into ruthless individuals compelled by war and you cannot help but empathise with her as she breaks down in self-pity. “Isse pehle ki main bhi aap sab jaisi ban jaoon, mujhe yahaan se jaana hai…mujhse aur ek khoon nahi hoga” she exclaims poignantly in a powerful scene from the film. Meghna’s careful hands handle an otherwise controversial story with utmost dignity. She cleverly turns your attention into the emotional journey of two individuals under the backdrop of war and patriotism. While an overtly dramatic and rather cliché climax could have been avoided, it’s only a minor hiccup in the otherwise compelling thriller. Meghna is also careful to leave emotions and sequences open to audience interpretations. Shankar Ehsaan and Loy provide just the right tunes in the background that blend into the story with Gulzar’s soulful words, a refreshing Kashmiri folk song and a reverberating Ae Watan by Arijit Singh. With a strong supporting cast, some edge-of-the-seat moments and two leading ladies (Alia and Meghna), Raazi makes for a perfect watch this weekend! What if the antagonist becomes the hero? Padmavat(i) or Allauddin Khilji? With layered eccentricity and fierce intensity Ranveer Singh’s Allauddin Khilji brings alive the antagonist once again in Sanjay Leela Bhansali’s epic drama, Padmavat. Mewar’s Rajput prince Maharawal Ratan Singh(Shahid Kapoor) is at once smitten by Padmavati (Deepika Padukone), Singhal’s charming princess who soon walks into Chittor as the Queen of Mewar. Envied for her beauty and her intellect by Ratan Singh’s first wife, Rani Padmavati also unknowingly evokes her charm onto priest Raghav Chetan. Chetan is ostracised for interrupting the couple’s privacy and in a fit of revenge, provokes the ferocious Sultan Alauddin Khilji to own the Rajput Kingdom along with its beautiful Queen. Battles both physical and intellectual are fought to possess the queen and also protect the gallantry of the Rajputs. But, when Ratan Singh is deceived and killed by Khilji, Rani Padmavati must uphold the Rajput valour by performing Jauhar(the ancient Hindu custom of mass-immolation) with hundreds of other women, thereby defeating Khilji’s purpose. Bhansali’s grandiose is here to stay with exquisite costumes, lavish sets and (of course) splendid war scenes but lacks an overall essence of magic like his previous films. Nevertheless, be sure to find his signature in the chandelier scene(read Hum Dil De Chuke Sanam) or a gigantic door that closes to leave the characters on either side(read Devdas). Biting into the character just as he bites his meat, Ranveer plays Khilji with barbaric sumptuousness! While Khilji’s megalomania takes you by both awe and utter disgust, there’s seldom a spark between Ratan Singh and Padmavati’s characters. Deepika’s Padmavati shines in gorgeous costumes, intricate dance movements and expressive eyes but her core character often blends with Leela(from Ram Leela) or Mastani(from Bajirao Mastani). Little is invested in Ratan Singh’s character, who continues to glorify Rajput values in his dialogues, never hitting the right chord. However, Raza Murad and Aditi Rao Hyadri do justice to their special appearances. The songs except for Ghoomar(already having done it’s fair share of rounds at most Indian weddings) are almost forgettable whereas the background score is decent. The jauhar scene is picturesquely shot while most other scenes that stay with you long after you’ve left the theatres belong to Ranveer Singh, who clearly is the man of the hour. The flavour of an Imtiaz Ali film lies in its ability to engage and entertain as the audience journeys through the traveller’s(read character’s) experiences. The director’s latest offering is a pie that we’ve often tasted but one that’s gone wrong with disproportionate ingredients. 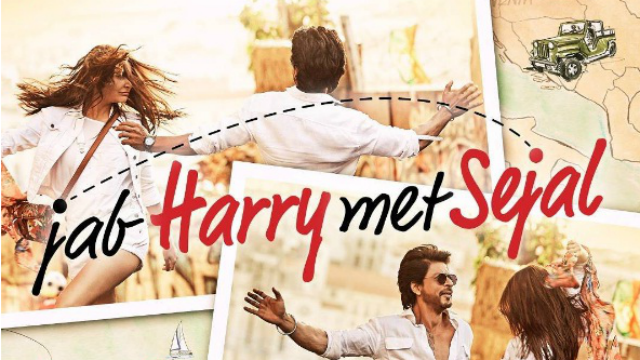 Jab Harry Met Sejal(much as it sounds like Jab We Met) tastes like most of Imtiaz’s films but unfortunately the exquisite locales obscure its pivotal characters. Harry(Shah Rukh) is Harinder Singh, the Punjabi tour guide who is forced to accompany Sejal(Anushka), the Gujarati chhokri, in finding her lost engagement ring across all of Europe. What follows is a trip to the pub, a night on the streets of Europe, an encounter with local goondas, role playing at a cafe in Budapest-blended with some singing and dancing. It’s soul searching in disguise for ‘what you seek is seeking you’. Been there? Heard that? Yes, we have. Be it free-flowing fun and frolic in Jab We Met or layers peeling off characters in Highway or even simplistic scenarios of arranged-love marriages in Socha Na Tha. Only that they were far more believable while this one fails to live up to the mark. That said, one cannot miss a few palpably-real moments created by Harry and Sejal with remarkable ease. Unfortunately, such moments are few. Mr. Khan knows the Punjabi boy(now man) too well to go wrong with the accent or the mannerisms. And yes, given the non-swooning character(too), he manages to charm with those eyes and that dimpled-smile even today, even as that vulnerable bad boy. Anushka pulls off the Gujarati girl fairly well though you’ll find the Punjabi kudi in her popping out of that patiala as soon as she hears the bhangra tunes. Perhaps, that’s all that the wafer-thin narrative allows our capable actors to do. The saving grace for JHMS, is the irresistible camerawork by KU Mohanan, for you’ll find yourself embracing each little corner of Europe. What let’s you down as a film-fanatic is the fact that an entourage that screams out names like Shah Rukh Khan, Imtiaz Ali, Pritam, and even Chandan Roy Sanyal is left unnurtured. A trite plot and half-peeled characters leave no room for for a creative and talented team that is capable of delivering better. P.S – For all the Shah Rukh fans out there(that includes myself) watch the latest interviews by Rajeev Masand and Anupma Chopra. These were featured as promotionals but carry repeat value for their wit, humour and those countless anecdotes shared by Mr. Khan. © 2017 reachyashika. All rights reserved. Anurag Basu’s tribute to his father and gift to his children is an endearing tale but one with a few overdone twists and turns. Jagga is Disney’s desi musical that poignantly tells the story of a young boy in search of his (foster) father. Basu takes no time to set the mood and you’ll know what you’re in for, right from fame one. 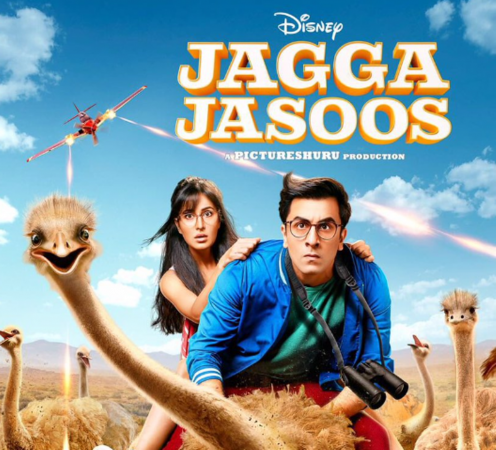 Jagga Jaasos is a sincere attempt to allure and engage the little ones and transport them into the fascinating adventures journeying through thought provoking life lessons, socially relevant scenarios stirring up genuine emotions. However, a convoluted plot leaves us wondering if we could get more out of the father-son chemistry that is at times lost amidst the humdrum. Ranbir is perhaps the best suited skin for Bollywood’s version of Sherlock Holmes. He emotes effortlessly and leaves you teary eyed in a few scenes. Saswata Chatterjee has clearly found the Mr. Bagchi in him through Kahaani and Jagga. Saurabh Shukla too is true to his character. Pritam’s album blends well with the musical. ‘Ullu le’ sticks on long after you’ve left the theatres. The song also marvels in Shaimak Davar’s neatly directed dance moves and quick witted words by Amitabh Bhattacharya. The screenplay seems slightly dragged at times but Basu covers it up with his remarkable ability to involve the audiences in some lingering scenes. Wait until the last frame for a hit and miss surprise. Looking forward to the so called independent life! Dormitories to guest rooms to multistoreys.. While the pulse of the city kept me alive. Then head straight to Blossoms bookstore on Church Street. Just walk into any Indiranagar brewery or a Koramangla pub. CTR, MTR and Veena Stores serve the best dosas, idlys and uthappams. Truffles, Bric Oven, Chinita, all covering different cuisines. Head to Cubbon Park for a nature walk or catch the sunrise at Nandi Hills! Also you’d find antics and handicrafts @Cauvery Emporium just on that road’s bend. Or catch an evening show at Chowdiah Memorial Hall! Just say ‘Kannada Gothilla’ and you’ll be doing just great!! It has instilled professionalism, confidence, grace & integrity. There was always family away from family. For moments in which the heart was forlorn. Couldn’t have asked for a better learning ground. The city truly deserves a mention, for it fostered my nourishment! And its after taste leaves me on a passionate high! Namma Bengaluru, I shall continue to love you! Pumped with technology, grandiose and glory! Casting the spell of old-school romance. By an enchantress, who had been scorned by them. Morphed under teapots, cups, pianos, candelabrums and clocks. If the Beast loved a woman and she loved him back in return. Witty and charming Belle entered the palace premises! The Beast’s kindliness did unfold. Only beware that it is upon nostalgia that you shall dwell!